I'm new to the Board.......will have a lot of questions for the Pride gurus out there! Picked this lovely old Lady today and brought her home. 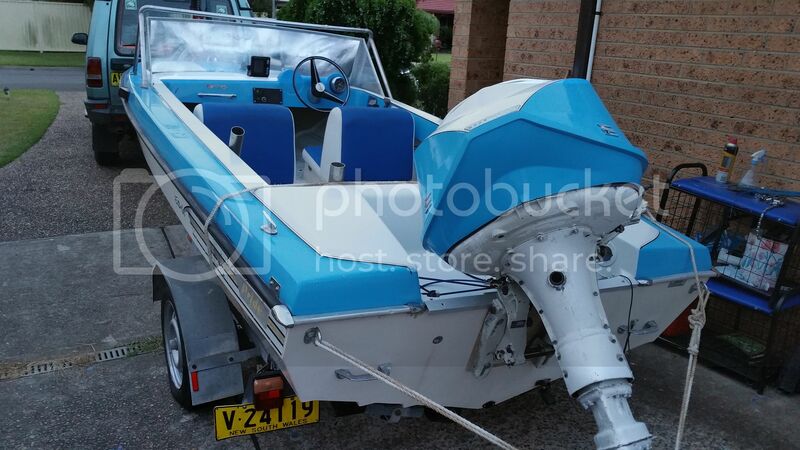 Same owner for 47 years, simply grew to old to lift the manual tilt Evinrude. Always liked the look of the Starfire's, but took a long time to find one good enough to use that also fitted my shoestring budget. Nice looking boat, love the boat club pennant on the hull. A little update on my vintage Pride. I cleaned up the twenty year old trailer, two coats of black epoxy enamel. Found a pair of '70's Ford ROH Aussie made mags on Gumtree that fitted the replacement Gal hubs I bought. I ended up replacing all the trailer springs, hubs, hanger bolts, and fixing bolts for the keel rollers. Also fitted a self centering roller at the back of the trailer to make retrieval a little easier solo. On my initial on water test the engine seemed to run OK, but was VERY thirsty! Turns out the fuel pump needed a rebuild, with new diaphragm filter and hoses. Every connection was leaking fuel...and on the vacuum stroke the crankcase was sucking in fuel too. I think I could disassemble that fuel pump now with my eyes closed! I also bought a basic compression gauge to test the engine before I did anything else. Happy to report a solid 100 psi in all cylinders, not even a 2 psi variation. Looks like a good 'un. The factory ignition switch was shagged, new prices were very scary so I decided to fit a 20 amp circuit breaker in the ignition circuit[after my near fire] and replace the key start with a reliable waterproof on/off toggle switch and a 'push button' start switch from Jaycar. This system is simple and reliable, and worked well until the starter motor died. Undoubtedly the contstant cranking trying to get the motor running with a crook fuel pump. 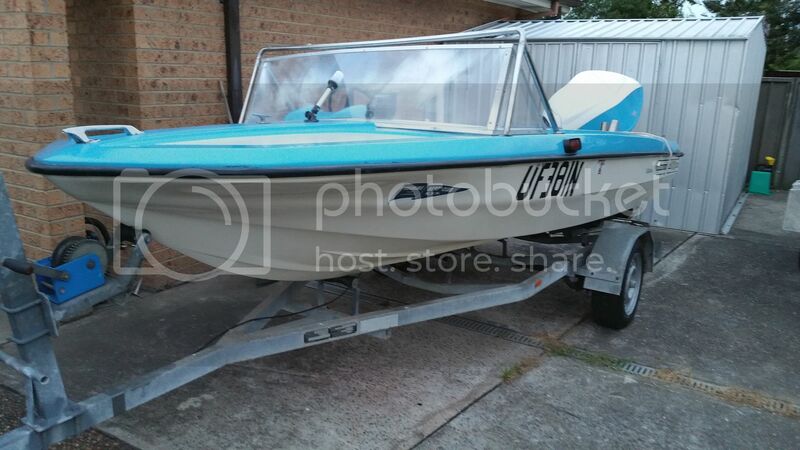 I had that professionally rebuilt by my local outboard guru and it now spins very fast indeed! I finally solved my fuel pump blues by buying two nitrile o rings to seal the hardened gasket in the fuel pump valves. When I finally had it running long enough at idle speed to get warmed up it was obvious there was a lot of unburnt fuel and oil in the crankcase by how much she smoked! Now needs a good blast at WOT to burn off the old two stroke oil. 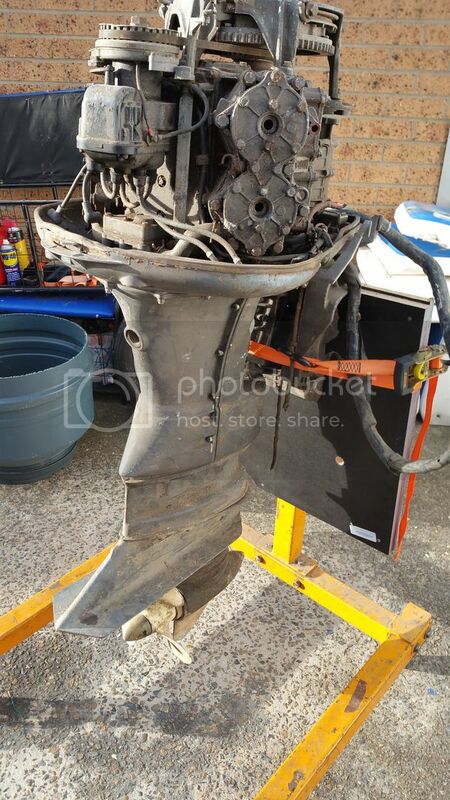 The prop that came with the engine was damaged, as well as being very worn. 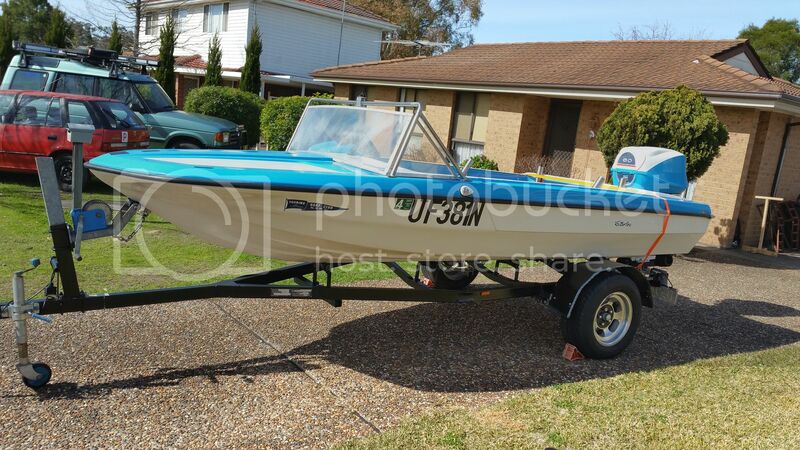 As luck would have it a Gumtree search one night revealed an 'Old, heavy V4 Evinrude' for sale about an hour and a half from my home. The prop was what I was after....these generation V4's used a special 'power prop' as described by online friends in the USA and the one on this old motor looked good indeed. New props when they come up sell for several hundred dollars and the new ones are not made as well as the old ones I was told. I offered $100 for the engine as is. 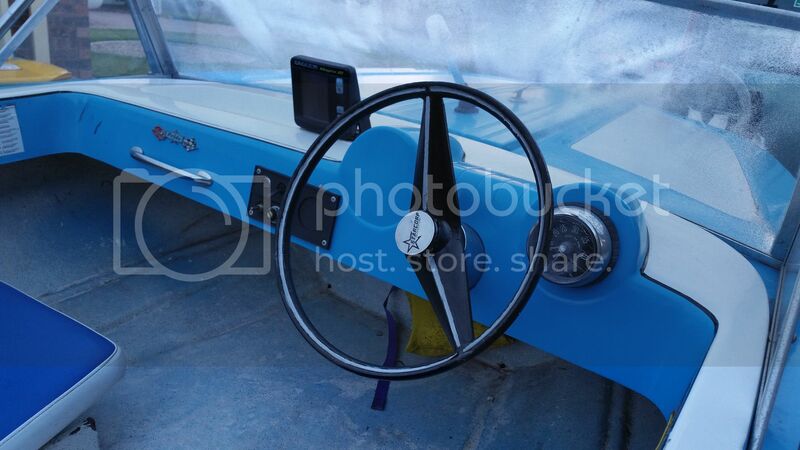 Turns out it is a 60HP 1966 model, with a magneto ignition and a back up pull start. It had been left partially assembled for twenty years hanging by a rope from the floor joists under the sellers' Father's home. He passed away while rebuilding it A deal was done, these old motors ARE heavy. The prop came up very well indeed, worth the purchase price on it's own. I checked the gear case oil, and it was like new. Also came with the original 'glass hood like mine, a carb and a wiring loom. There was a new impeller I grabbed as well. The whole lot was destined for scrap or landfill. 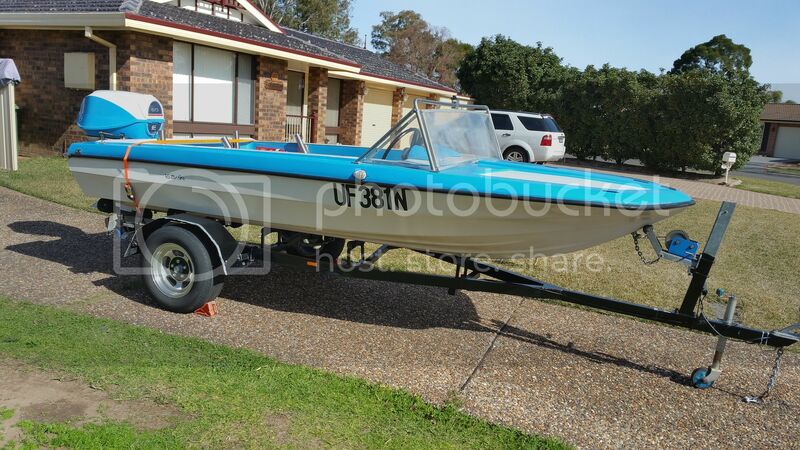 The seller could remember when he was a boy in the sixties this motor pushing a heavy cruiser from Wollongong to Sydney. A little bit of history saved. I had to rewire everything from the midships connector forward after the short circuit and near fire. Lesson learnt big time. 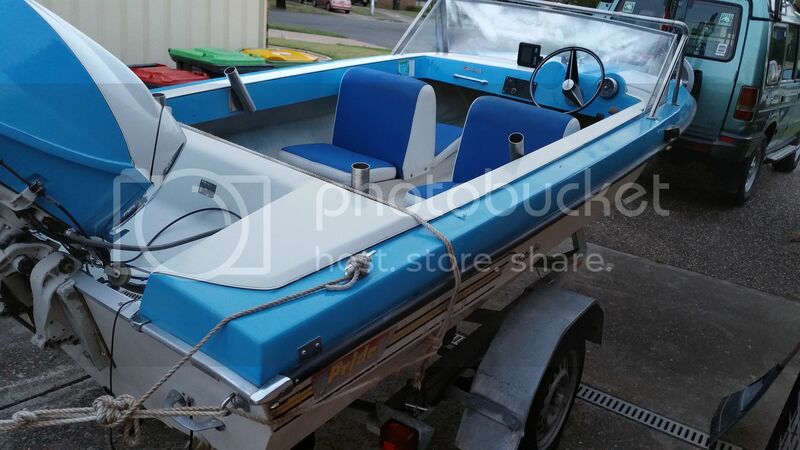 Katie Lee III will be fishing boat firstly, so I ditched the back to back seating and fitted some timber rails with a pair of swivel folding seats. 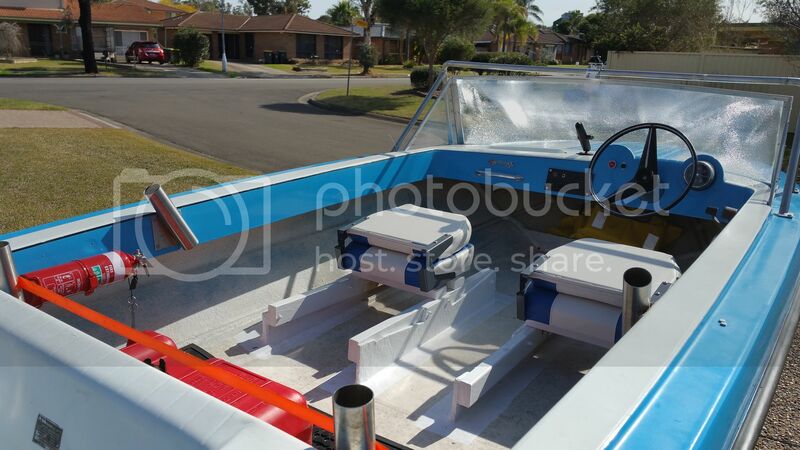 I still need to set up a mounting for my icebox behind the first mates seat and a similar mount behind the Skippers seat too. Both will be easily removable when stationary but secured whilst underway. I'll do most of my boating alone probably as my wife doesn't share my love of the water and the outdoors. Always v impressed with you guys who can resolve seemingly major engine issues and get old things going. I'm sure it's in my brain somewhere (somehow medicine and engines must cross), but I'm mechanically rather inept, and would love to be brave enough to tackle some of this stuff. 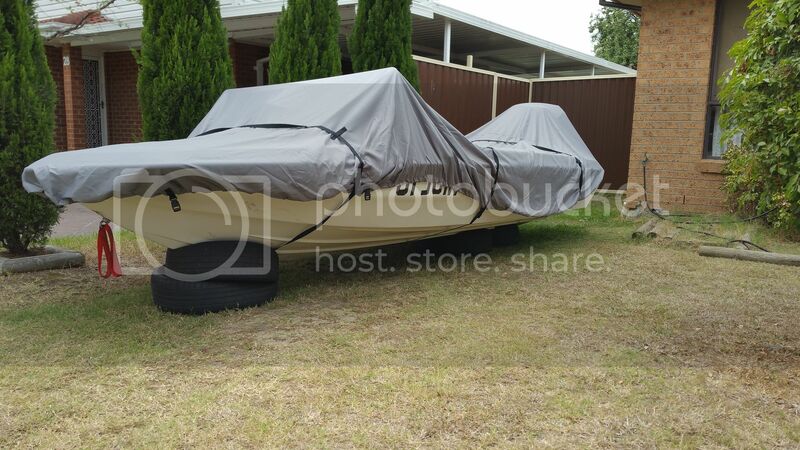 Unfortunately my own outboard seems to work, most of the time, so I'm loathe to pull it to bits, and potentially stop it from working - I probably need to buy one that doesn't work, and then I have nothing to lose! I do hope you're going to reprint the engine cowl though! !